If you want to help me make more comics, you can do that here on Patreon. Thanks! We aren’t just getting in too many Cards Against Humanity sets, we’re getting shipped in too many of the copycat games too. “What do you meme?” and other variations on the “Impress the Judge” mechanic, but with naughty words. I’ve played Cards Against Humanity a few times and chuckled about the same amount. It wears thin, but I guess people see it as the perfect party game for relatives and such. Uncomfortable laughter and awkward exchanges can make for a good time, but then you have others who will over analyze every single card passed their way when they’re the judge. They ruin those types of games. Best to play Bang!, or Coup, maybe Hellapagos? Games where you can include them, and then immediately knock them out of the match to get to the real game with people who are willing to play. Or go for the games that over analyzers would love, Code Names, bluffing games like Resistance or Sheriff of Nottingham would be great for them. 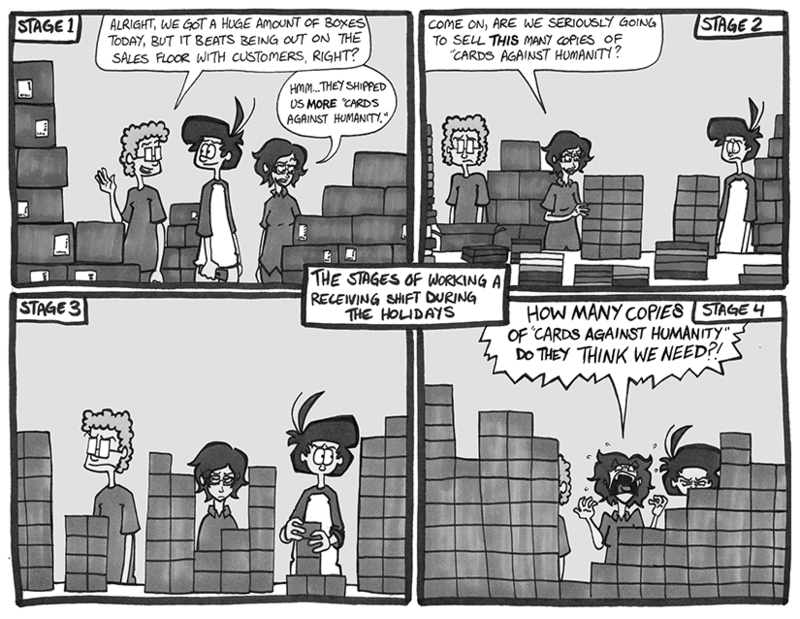 Or just stop buying Cards Against Humanity? We have way too many and I seriously doubt we’ll be able to sell even half of our stock by Christmas and Home Office keeps sending us more!